Many pendants and necklaces were found in the wreckage of the Titanic. Is that the necklace they found? I am amazed that it is in that good of condition considering 99 years have past since the tragic incedent. I am also amazed on how rich and wealthy the people were and all the stuff they had! Its a shame it sunk only after 4 days of sailing. Not even a week past by! I think they should have left everything the way they found it in peace! i think they should recover all the artifacts they can from the wreck scene,just because the fact that we can learn more about are long lost ancesters and get rich quick!!! 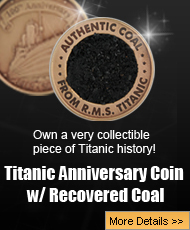 The RMS TITANIC continues to facinate the world, ever for 99 years since the sinking. I have been writing a novel for around a year or two and it truly sadens me that people would just go and take Titanic artifacts. I beg of you, let those who perished rest in peace, including the greatest lost of all TITANIC. Please?